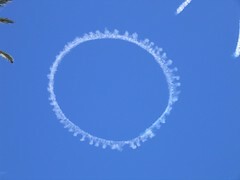 Sitting at the botanical gardens last sunday when a skywriter started doing his thing. The 'O' he started with was a nice round one and, being a calm day, retained its shape well. But after a while, it started to disperse in an interesting manner, as you can see!